We run into interesting applications that require cooling all the time. 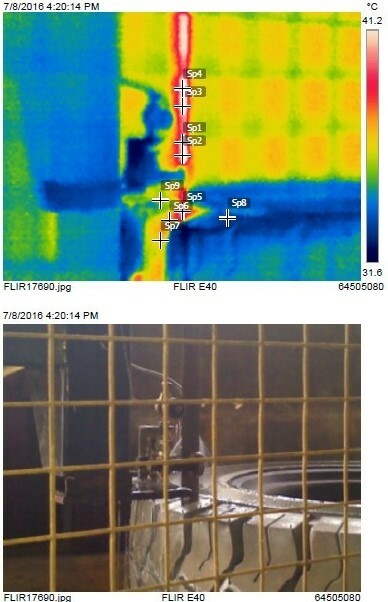 Here’s an example of a spot cooling application for a tire cutting application that used a FLIR camera to show the heat generated within the band saw blade. The customer is a world supplier of tires for various vehicles from ATV to construction use. And they have a need to cut tires up for quality control testing as well as R&D purposes. 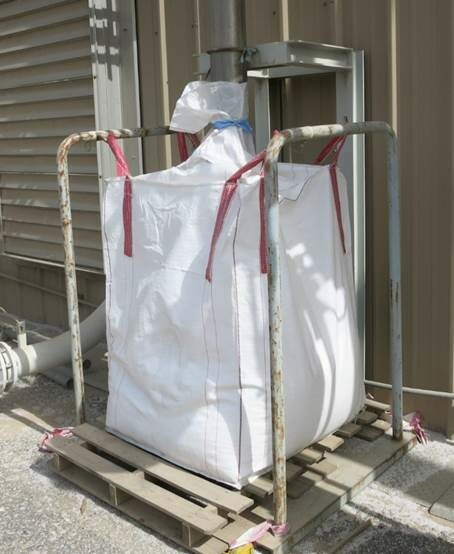 They were looking for a low cost and efficient way to cool the blade without using liquid coolant or water as those methods require implementation of waste handling schemes that this customer did not want to deal with. So, they came to EXAIR as they knew we specialized in cold air cooling products. Specifically, they had interest in model 3925 (Dual Point, Adjustable Spot Cooler System). The dual point hose kit would allow for even cooling on both sides of the band saw blade. After discussing their application details, we agreed that model 3925 would be the best offering we could make to the customer. As we have a band saw in our workshop, I located some rubber material that we had with similar properties to a tire and made some quick tests to determine that in fact, model 3925 allowed for only a modest 5°C rise in temperature. The customer was quite satisfied at our test result and purchased 4 units for their band saws. Recently, I was working with a customer who specializes in post-harvest fruit processing. In this case, they were processing mangos from complete fruit down into cubes which are subsequently cleaned and packaged into plastic bags and then cardboard boxes for use in other food products. When the customer contacted me, they were using a stainless steel pipe with holes drilled into it to de-water the fruit chunks after being sprayed to clean the individual pieces. They were using stainless steel pipe as they had a requirement for stainless steel construction due to being food grade facility. The problem with the pipe was that the airflow didn’t provide an even blowing force across the full, 30 inch width of the vibratory conveyor. The pipe solution also used quite a lot of compressed air. Unfortunately the customer could not measure what it was, but they gave me the number and size of the holes drilled into it. From that information, we could determine that they were using about 150 SCFM of compressed air at this one location. And so, with the ineffectiveness of the pipe as well as the high air consumption, the customer went looking for something better. That’s when they found EXAIR Stainless Steel Super Air Knives on our web site. After some quick discussion to sort out the width of the conveyor and to establish what the need was, we settled on model 110030SS (30” 303 Stainless Steel Super Air Knife) to be mounted across the width of the conveyor (see photo above). With the Super Air Knife installed, the customer was able to achieve the effectiveness he needed for the de-watering and at an airflow rate that was 42% less compressed air use than what he had before. Some of the other benefits that they were able to achieve without even being conscious of it were the enhanced safety of the OSHA compliant Super Air Knife and the sound level was cut dramatically as well. EXAIR’s Super Air Knives are used many times in processing and packaging applications to provide a non-contact method for de-watering, blowing off dust, moving product off to one side, drying, ejecting and many more applications like these. 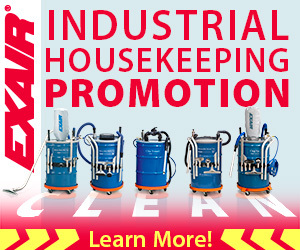 E-vac and vacuum cups lift, large, heavy objects! Our Chinese distributor had a customer who was producing the aluminum pieces that are formed into wheels for the automotive industry. Their process involved saw cutting large diameter, aluminum bar stock so it could be further processed. The problem was once the parts were saw cut, they were slippery and difficult to handle. So, the customer was looking for a good way to handle these parts that was safe and effective for the operator as well. Our distributor offered the idea of using vacuum cups and an EXAIR E-vac for the project. We determined that the aluminum raw stock that would be picked up would have an effective diameter of 254 mm on which vacuum cups could pick up the part for transfer. Also, the parts could weigh up to 45 kilos. So, we needed to find a vacuum cup (or cups) that could pick up that much weight with the surface area allotted to us. After reviewing our options, we came to the conclusions that (3) model 900759 vacuum cups would have a combined lifting capacity of 100 kilos when powered at -71 kPa vacuum. These vacuum cups have a 108 mm diameter and so can fit nicely in a triangular orientation on the saw cut area of the aluminum part. Then came the part where we recommend which E-vac generator to use. We already calculated in our usual 2X safety factor for weight being lifted. So we are quite confident that the cups can do their job as long as sufficient vacuum could be maintained. We are lifting solid aluminum, so we know the material is non-porous. So, that’s the version of the E-vacs we will take into consideration for the project. The part about determining which E-vac to recommend is not as clear cut and well defined as picking the vacuum cups is. So we must use our best judgement based on the weight of the item, the size and number of vacuum cups being used, and the surface finish of the material. Since the material will be somewhat on the heavy side and it would be a real problem if it were dropped, I recommended our distributor go with one E-vac vacuum generator per each vacuum cup. The vacuum generator I recommended was from the middle of the available models from a performance standpoint. That was model 810008M (8.4 SCFM Non-porous E-vac with straight through muffler). In this way, if one cup were to lose vacuum for whatever unforeseen reason, the other two could still support the full weight of the object as it is being lifted and moved. Once the customer had their lifting fixture fabricated and the E-vacs with vacuum cups mounted, the lifting unit worked very well to address the customer’s concerns about worker productivity and safety. E-vacs can be used for a variety of tasks, but lifting and placing applications tend to be the more prevalent ones. If you have a lifting or moving application of your own and think that vacuum technology might be useful, contact us with your questions. We thrive on helping folks like you solve such problems in industry. In this summer of 2016, we are nearing the beginning of one of the largest sporting events on the planet, The 2016 Summer Olympics. At the heart of this celebration will be sporting events of all kinds. And in the tradition of the Olympics there is always a gold, silver and bronze winner to award the top three athletes in each event. 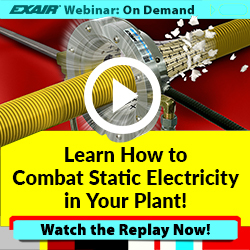 EXAIR is participating in a competition as well. It isn’t one of a sporting nature, but rather, one of ingenuity and innovation. Flow Control Magazine holds an annual competition for innovations in new products available in industry and we have entered the No Drip Atomizing Nozzle into the competition. In general, Atomizing Nozzles are used for the application of high value fluids within industrial processes. In some cases where the Atomizing Nozzles are mounted above the target, residual fluid that is left inside the nozzle body can drip out when de-energized and cause un-wanted blemishes on the target surface. EXAIR No Drip Atomizing Nozzles allow for external adjustment of compressed air and liquid inputs to adjust the liquid spray flow rate as well as droplet size for a wide range of applications. That’s pretty common amongst atomizing nozzles in general. So what is so innovative about the No-Drip Atomizing Nozzles? We have found a way to control the on/off function of the atomizing spray which supports the no-drip feature as well as the atomizing flow with only one compressed air supply. Most other manufacturers require a nozzle that has a separate control for the small valve within the nozzle and another for the airflow that atomizes the fluid coming through. It is this innovation that dramatically improves the simplicity with which these nozzles can be installed into an application and controlled through typical air automation techniques. It was innovative enough that the US Patent Office granted EXAIR a patent on the design (Patent # 9156045). So, we’ve made the No-Drip Atomizing Nozzle available with 3 different spray patterns and 14 different liquid volume options to suit a wide variety of application need. Operating pressures can fall anywhere between 30 – 250 PSIG to atomize fluids up to 300 centipoise. If you agree with the US Patent Office on the innovation and think that EXAIR’s No Drip Atomizing Nozzles should be a winner in this competition, we would appreciate your official vote. Please vote for the EXAIR No Drip Atomizing Nozzles at this link to the Flow Control Magazine’s Innovation Awards page. Copper and its alloys are used in a variety of products from consumer goods like musical instruments, drawer and door pulls, wind chimes, electrical contacts and many other, similar parts that you do not see on more complicated pieces of equipment such as HVAC systems. Comparatively speaking, copper is quite a malleable metal. That’s what makes it so useful for manufacturing processes such as expanding, reducing, flaring, beading and other similar processes that don’t necessarily involve a cutting or grinding action on the material, but rather a tool that comes into contact with the material to impart a specific shape that makes the made part beneficial to some other product or process. And so, in the metal forming process, you generally have a hardened alloy tool that comes into contact with the soft copper (or brass) to impart one of the above mentioned effects to the material. With the metal forming process, you have friction that needs to be reduced substantially to aid in the forming process while maintaining the tool integrity and keeping heat generation to a minimum. There are a variety of oil-based lubricants that companies who specialize in this kind of processing, will use to lubricate the raw part prior to forming. This is the point within the process where EXAIR Atomizing Nozzles can play a significant role in application of the lubrication. By atomizing the lubricant, the customer can have a controlled, even application of the lubricant to the tooling and/or material surface prior to putting the material through the forming operation. By applying a controlled layer of atomized lubricant, the customer can apply the lubricant in a sparingly manner to conserve on how much is used for each part formed. They get the benefit of the lubrication without over-doing it and wasting excess volume of lube applied. This, in turn, allows for a cleaner and safer processing area as well as measurable cost savings for the lubricant as well. For lower viscosity lubricants (< 300 cP) that require only a light application of material, we have model AN1010SS which can provide a Narrow, Round spray pattern to coat smaller parts. If the part is larger or perhaps starts out as a sheet, we do also have model AW1030SS which can provide a Flat, Wide Angle spray pattern. If the lubricant has a viscosity that is higher than 300 cP, we also have a series of External Mix Atomizing Nozzles with similar spray flow patterns that can be selected for high precision adjustment of the liquid flow and droplet size to suit any need. If you are in the metal forming industry and you are concerned with application of lubricants in your applications, we be glad to help you pick an Atomizing Nozzle to suit your needs. Contact us to discuss your application. 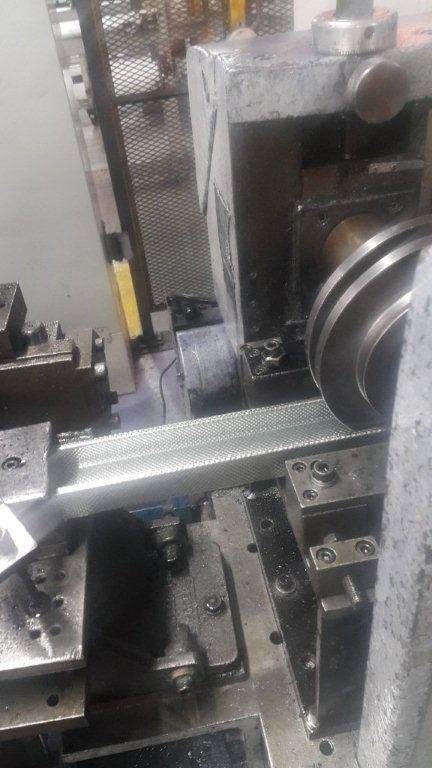 Our distributor from South Africa contacted me recently with a problem that one of his customers were having with their roll forming process. Their business is making metal studs used for erecting walls and covering with drywall. The metal studs start out as a 200 mm wide x 0.5 mm thick roll of sheet metal. The customer feeds the sheet metal through a series of rolling dies that gradually impart the final shape of a metal stud to the material. 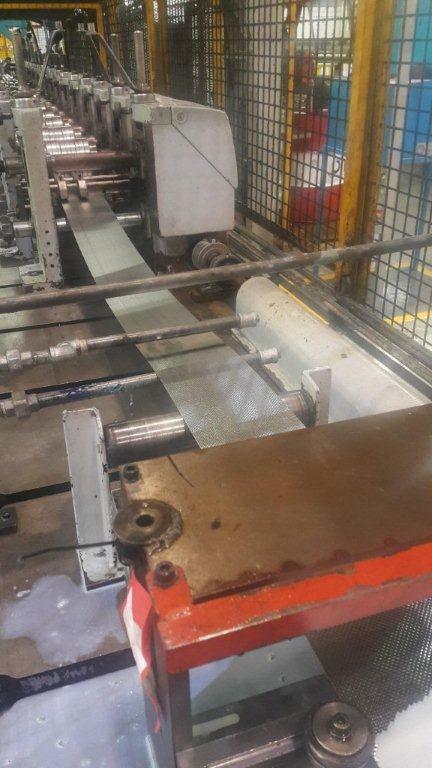 During this process, a lubricant is applied through a couple of metal pipes with drilled holes in them to disperse the lubricant onto the metal sheet. The problem with the application is that it makes a total mess because there aren’t any controls on the fluid flow to keep the application rate where it needs to be. All they need is a light coating of the lubricant. What they’re getting now is a constant drizzle from multiple holes. Not only is this wasteful for the use of the lubricant, it causes a huge mess in the form of puddled lubricant on the floor. This problem also presents a slip and fall hazard to the operators as well. See the photo below. In an effort to help them, my friend Wayne contacted me about the situation and presented a couple of scenarios he had in mind. One was to keep the existing system in place and use a couple of Super Air Knives to blow off the excess lubricant into a catch basin. The other was to apply a couple of our Internal Mix, Wide, Flat Atomizing nozzles into the application to provide a fine spray of the lubricant on both sides of the sheet metal. After asking a few questions about whether the liquid was under any sort of pressure, its viscosity and the desired application rate I suggested to Wayne that the customer go with (2) pieces of model AF1010SS Internal Mix, Flat Fan Atomizing Nozzle. This Atomizing nozzle is more than adequate to provide the customer with the precise amount of the lubricant onto the sheet metal just prior to forming. The point in recommending the atomizing nozzles is to conserve the customer’s lubricant when it is applied in the first place so that they don’t have the huge mess that ends up developing during continuous operation. In this way, they are not treating a symptom of the problem by blowing the excess lubricant with a Super Air Knife, but rather tackling the problem right at its source by choking back on the application of the fluid in the first place. After the customer installed their nozzles and made a production run, they were able to dial the application rate in to exactly what they needed. The mess and safety hazard went away and the customer was able to cut their lubricant use by half so far. They say they will continue to try and optimize its use as saving the lubricant used represented a nice cost savings to the customer that they had not thought about prior to engaging our distributor to help them take away this headache. They were simply concerned about the mess in the beginning. It’s always nice to have such positive knock-on effect when you make process improvements like this.